As many a shipwrecked sailor can tell you, the Florida Keys can be a beautiful yet daunting place. Blessed with clear waters that belie shallow depths and coral heads, the Keys are a paradise- and for some, a nemesis. However, with proper local knowledge and good seamanship, safely transiting and enjoying this unique part of the United States is a reality for modern day mariners. 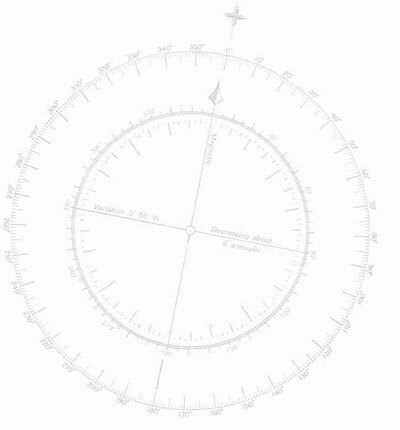 The good seamanship, well that part is up to you. For local knowledge go with the pros, Claiborne Young and his co-author Morgan Steinmetz. The Young and Steinmetz duo are no spring chickens to the art of cruising. Young himself has logged thousands of miles sounding and cataloguing the intricacies of many a U.S. waterway with his wife, Karen, for 20+ years. The authors have recently completed an exhaustive update to their popular guide "Cruising the Florida Keys," and if you are planning (or dreaming) about a cruise through the Keys, we highly recommend getting a copy. For starters, as is their practice, the authors have personally sounded depths in channels and anchorages and provide every angle of approach to the different avenues of transit through the Keys. Whether you take the offshore Hawks Channel route or the inside ICW route, the updated guide helps you navigate whether you are headed north or south (or east and west, as the case may be in the Lower Keys). The information is presented in both directions when necessary so you don't have to read the book backwards. Secondly, the updated guide provides valuable information about damage and repair to facilities that arose during the 2005 hurricane season, namely during Hurricane Wilma. As Steinmetz writes, "Katrina and Rita, ladies of ill repute, had passed by earlier in the season with all the delicacy of a drunken, tatooed, north Florida redneck crashing a debutantes' cotillion." The one-two-three punch had such a widespread impact on the area, that Young and Steinmetz delayed the printing of this guide in order to spend another 6 weeks in the Keys tracking the damage and updating on the recovery of marine interests and local businesses. We are the beneficiaries of their dedication. The last chapter lists each facility in the order as it appears in the book with a description of its damage/repair status as of press time. That leads me to make note of the only drawback of this book. The authors had to squeeze all that information into one guide, resulting in 600 pages,which takes up two whole inches of precious shelf space. This guide is perfect for reading ahead and getting prepared for the next stop on the journey; it's hard not to get in the cruising mood while reading the authors' eloquent, southern charm prose. However, it is not built to carry around town with you, unless you have one of those nifty collapsible carts or strong shoulders. This second edition of "Cruising the Florida Keys" achieves its goal of providing reliable isntructions and lively commentary about traveling from the Port of Miami to the Dry Tortugas. If you are joining the cruising community for the first time, or if you are a veteran cruiser, make sure to check out Young's website, www.CruisersNet.net. The website is a testament to Young's commitment to the cruising community, where cruisers help cruisers with updates on waterway conditions and facilities. Purchase Claiborne Young's "Cruising the Florida Keys" Here! 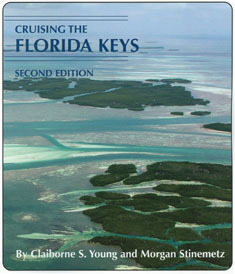 Click here to read a review of Claiborne Young's "Coastal Charts for Cruising the Florida Keys"